The first obvious pun is the phrase along with his name. 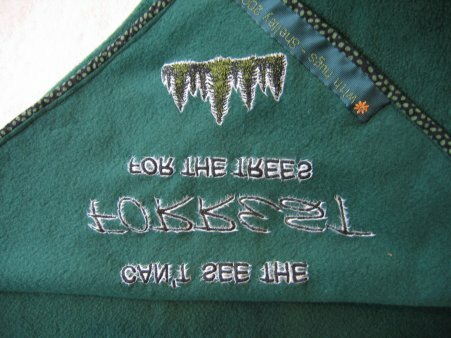 If you look at the picture above, you'll see that in a thread color that very closely matches the color of the fleece, I've embroidered "Can't see the" and "for the trees". 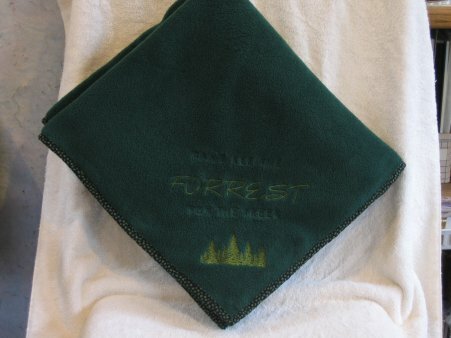 His name, Forrest, is in a lighter color green so it stands out. From a distance, you might see there was "something" above and below his name but it's not immediately discernable. 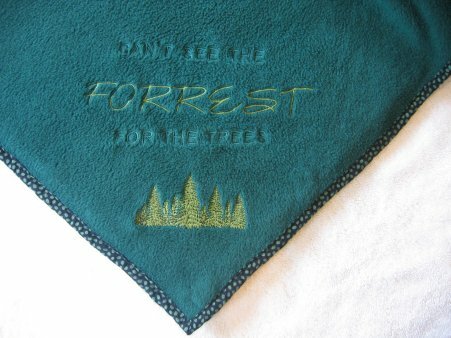 The second pun is obligatory forest scene of trees. is what remained. I clipped as much as I could but it wasn't what I would have liked for a gift. However, I have been told upon subsequent launderings, the stabilizer *has* become less substantial.